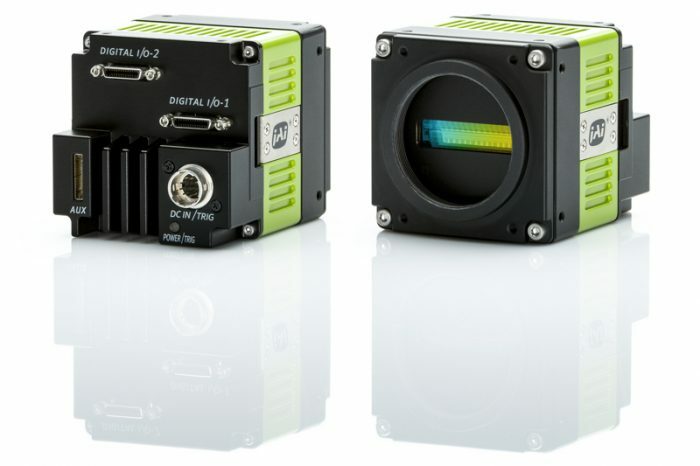 The new SW-4000TL-PMCL trilinear camera expands the options for designers of color line scan-based systems, which have previously relied on JAI’s Sweep+ Series of prism-based RGB and RGB+NIR line scan cameras to deliver the maximum in color image fidelity, sensitivity, and configuration flexibility. The high-performance trilinear technology in the SW-4000TL-PMCL has been combined with a broad set of advanced features – many of them unique among high-speed trilinear cameras – to give designers an attractive alternative for applications not requiring the ultimate precision provided by prism cameras. The SW-4000TL-PMCL features spatial compensation and tilted view correction functions to maintain proper synchronization and alignment of the R, G, and B channels. In addition, the camera features four separate input lines plus built-in algorithms to support direct connection from up to two rotary encoders. This eliminates the need to connect the encoder via the frame grabber, simplifying the cabling and reducing the possibility of lines being dropped due to issues between the frame grabber and the camera. The direct encoder connection capability can also be used to daisy-chain multiple SW-4000TL-PMCL cameras to each other in multi-camera setups and can be used to automatically detect if the scan direction changes. If a reversal of direction is detected, the spatial compensation can be adjusted for the correct line sequence. This feature is extremely useful for scenarios such as when a reciprocating slide table is being used as the method of conveyance. Additional standard features include gain and black level adjustment, manual or automatic white balancing, shading correction, PRNU and DSNU correction, and timestamping of line data. The SW-4000TL-PMCL utilizes a GenICam and Gen-CP-compliant Camera Link interface with Mini CL connectors to output line data. Base, Medium, Full, or Deca configurations are supported, depending on the bit depth and line rate required. 3 x 8-bit and 3 x 10-bit output can be selected. For more information, please visit http://www.jai.com.